This week has been full days of working in the studio, including weekends. 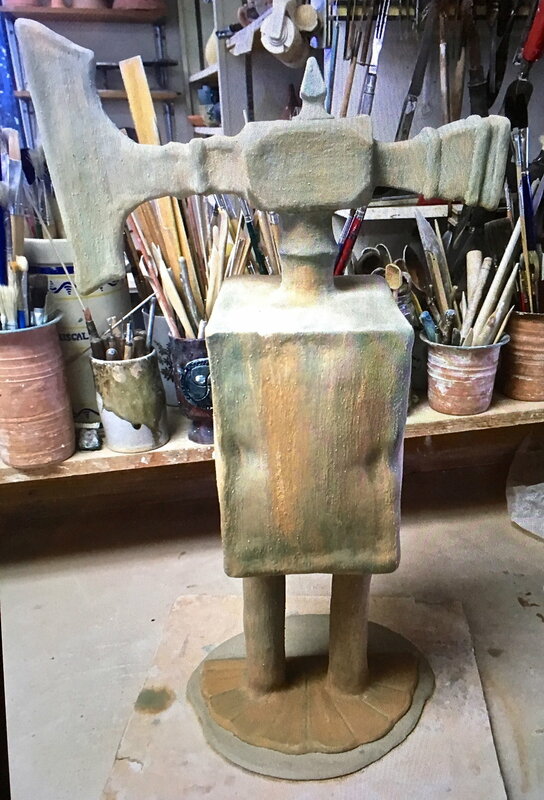 I have started a body of work, which are human tools with a figurative element. Historically, our ancestors used different tools for survival and these included tools to build, cook, defend, etc. These tools are a part of who we are, whether we remember their use or not. All these "tools" have helped our generations survive and thrive through today. In this theme, I chose tools that have come from my different ancestry, which when combined are what makes up my genealogy. Note: The images below are all pre-fired, so they will look different once fired. Human form of German combination tool from the 1600s of dividers, grips, hammer, and chisel. I continued with this process and made two more large sculptures based off of my ancestry. The original combination tool that I used as inspiration to this sculpture is below. Description: France, 18th c. Wrought iron. Consisting of hammer, hatchet, a pair of pliers, screw driver, awl and 2 further turn screws hidden in the handle ends. 15 cm. I made three large sculptures, however only have images of the two. I then moved on to other tools and weaponry. German sugar snippers from the 1700s. This will be multi-media and connected with wire. I then moved on to Native American and made a Blackfoot War Club. I made the handle figurative and turned the club itself into a rattle. Female figurative sword, which will have leather added to the handle and a luster emblem added once fired. The week rounded out nicely with a Let's Face It! Ceramic Workshop with Kim Clarke on the back patio of the Betarice Wood Center overlooking Happy Valley, as we learned how to sculpt the human face, with concentration and emphasis on the details. Helping a student with putting a face on it! Fantastic Workshop Thank you, Kim! I have been playing extensively in studio and await the firing results.